Thanks to a grant from the US Department of Defense, we have created a line of products specially for those parents and caregivers serving our military. These items include brochures, posters, magnets, and more, all promoting the education of SBS prevention and used as a gentle reminder to never shake or hurt an infant! Military Personnel Only - This bookmark is a parent or caregiver’s best tool in understanding what is best for the baby and themselves by staying calm when stress from crying set in. Military Personnel Only - This brochure helps new mothers understand normal infant crying patterns. It offers tips for calming and enjoying your new baby. It also describes causes and symptoms of SBS and what to expect after deployment. Military Personnel Only - This tri-fold brochure gives tips on building a relationship with your new infant, discusses the normalcy of infant crying, the dangers of shaking a baby, and how to stay connected with your baby during deployment. Military Personnel Only - This colorful, informative, three panel brochure offers education to all caregivers about the frustrations of coping with a crying baby and several calming techniques. It also includes the possible consequences of shaken baby syndrome. Military Personnel Only - The diaper bag insert is easily removed and provides space to fill in personal contact information while still serving as a great reminder to never shake. It includes plastic sleeve and lanyard. Select from Asian, African, Caucasian, or Hispanic options. 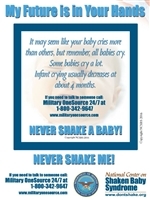 Military Personnel Only - This 3” x 4” magnet has a pop-out center that reminds caregivers to cope with infant crying. It is the perfect size for a photo to be inserted. Military Personnel Only - The Dads: The Basics Guidebook is a comprehensive handbook on fatherhood. It discusses the infant's basic needs, coping techniques for crying and an overview of SBS/AHT. There is also a section that teaches how to manage deployment with being a new father and connecting with your baby.